SERVPRO of Columbia, Montour & Sullivan Co was called to a commercial water loss at the training Medical Center in Laporte, PA. 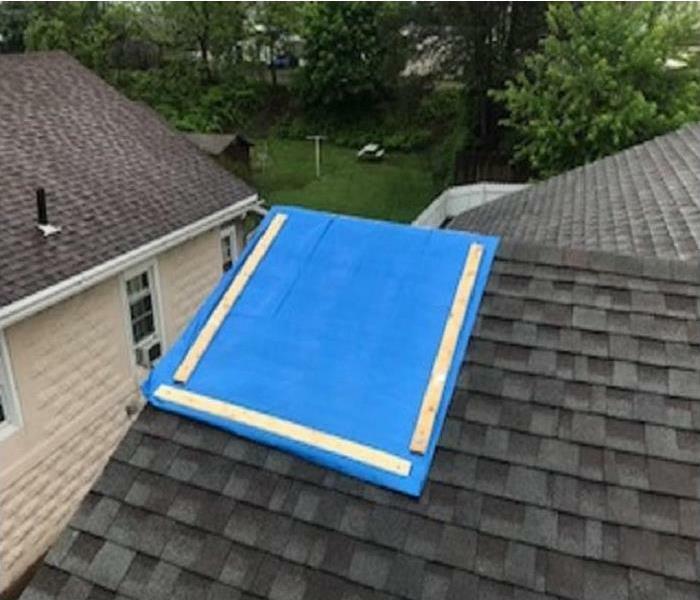 The loss was caused by a roof leak when the flat roofing material was being replaced. 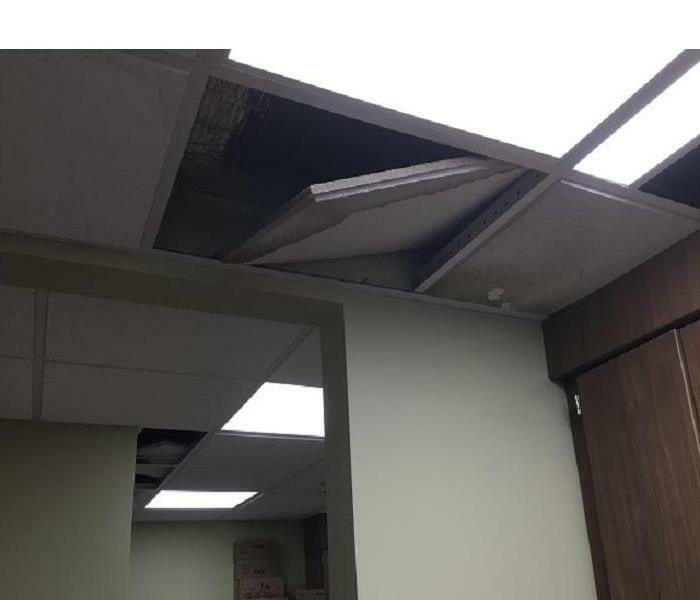 Suspended ceiling tiles were affected in the front half of the building, as well as insulation on the heating duct, drywall in a hallway and a bedroom and bathroom. Minimal damage occurred to the building: SERVPRO was able to remove vinyl cove base to ventilate the wall cavities and dry the walls. The ceilings were dried by placing air flow both below and above the surfaces. Carpeting had dried prior to our arrival. Once drying was accomplished, within 3 days, the roofing company was proceeding in restoring the building. Have You Been Affected By Fire? This is a picture of a tarped roof. been affected by a fire. We all see the effects on property with boarded up and tarped buildings. The effects on the people that have sustained a home fire. The physical stress is enormous as is the emotional stress of losing your material possessions and possibly family or pets. Financial liabilities can ruin the family if insurance does not adequately cover the loss or if there is no insurance. Even if you rent a property, it is recommended that you have renters insurance to cover your contents. wall and ceiling surfaces, forcing smoke into the spaces inside the wall and ceiling cavities. This can be evident around electrical outlet or light switch covers. Failure to remove the walls and ceiling surfaces and any insulation in the cavities will leave the odor to become a large problem later in the restoration process. This adds immensely to the cost of the remediation and restoration. 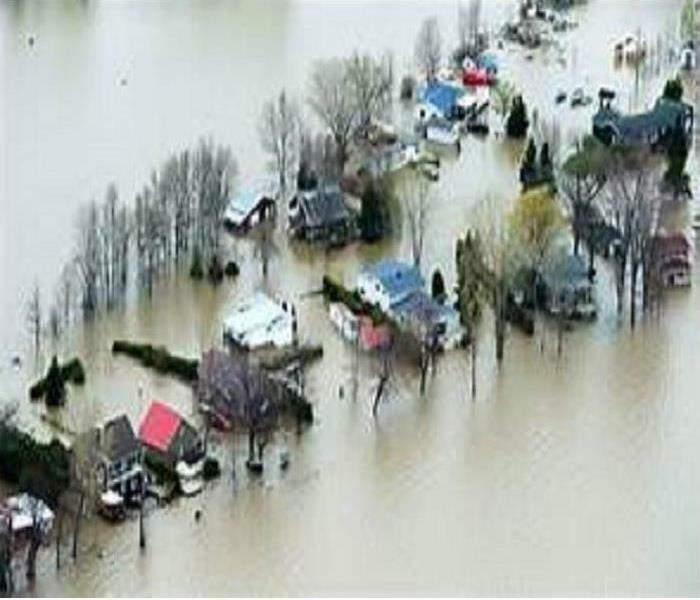 Floods are the most common type of natural disaster in the United States and the leading cause of weather-related deaths. Floods can be caused by many different natural or manmade phenomena including hurricanes, tornadoes, tsunamis or sustained heavy rains. Unlike other types of disasters that tend to be more regional or seasonal in nature, flooding can happen at any time and in every part of the country. Just because an area has never had flooding doesn’t mean that it will never experience one. And, areas that have flooded previously may experience another flood in the future. Floods vary in nature. Flash floods develop quickly, sometimes within minutes of a rain event. Other floods develop over a period of days, or they may accompany another disaster, such as a tornado or hurricane. Flooding can also occur if a dam or levee breaks. 100-Year Flood: A statistical estimate that models stream flow peaks over a period of time to determine if a watershed has a 1% chance of flooding in any given year, or a chance of flooding once every 100 years. Flash Flood Statement: A statement issued to inform the public about current flash flood conditions. Flash Flood Warning: A life and property threatening flash flood is occurring or will occur within the next six hours. Anyone in a flood prone area should move to higher ground. Flash Flood Watch: Flash flooding is possible. This is issued when flooding is expected within 6 hours after a heavy rain has ended. Be prepared to move to higher ground. Flash Flood: A flood in hilly or mountainous areas that occurs after a heavy rain. Flood Advisory: Announcements issued to advise the public of a minor flood event. Flood Stage: The point at which a body of water overflows banks onto dry land. Flood Warning: An 80% chance of moderate or major flooding is occurring or will occur soon. Prepare to evacuate. Evacuate if advised to do so. Flood Watch: There is a 50% chance of flooding. Flood: Partial or complete inundation of two or more acres of normally dry land or of two or more properties by tidal waters, runoff of surface waters, mudflow or collapse of land surrounding a lake or other body of water. Floodplain: Any land area that is susceptible to flooding from any source. Major Flooding: Flooding with extensive damage to structures and/or roads. Minor Flooding: Flooding with minimal or no property damage. Moderate Flooding: Flooding that impacts some buildings and roads near a stream or other body of water. Now that you know more about the major storms that you could experience, use this checklist to make sure your facility is prepared to handle these weather events. We also included specific steps to take before, during and after each major storm. Let us help you to understand the different categories of water damage. There are 3 different types. CAT 1 - water that comes from a sanitary water source and that do not pose substantial health risks. Even if the water loss came from a clean water source in the beginning, the environment or the time that passes since the damage occurred can change the classification of the water to a Category 2 or a Category 3. CAT 2 – water that originates from toilet bowls with urine (no feces), sump pump failures, seepage due to hydrostatic failure, and water discharge from dishwasher or washing machines. Rainwater that makes its way into a home from the outside is also considered and treated as a Category 2 since there is no way of determining what types of contaminants it encountered before entering a property. CAT 3 – Black or Toxic Water – water that is extremely contaminated and can contain pathogenic, toxigenic, or other harmful agents. This kind of water may carry silt, organic matter, pesticides, heavy metals, regulated materials, or toilet trap (no matter what is in it or the color), all forms of flooding ground surface water and rising water from rivers or streams, and other contaminated water entering or affecting the indoor environment such as wind-driven rain from hurricanes, tropical storms, or other weather related events. We’re always here to help you understand your situation, to resolve your water loss problems and get you back to “Like it never even happened”! CLASS 1 – Slow Rate of Evaporation. The water affects only a portion of a room. Materials have a low permeance/porosity. Minimum moisture is absorbed by the materials. CLASS 2 – Fast Rate of Evaporation. The water affects the entire room of carpet and padding. The water may have wicked up the walls, but not more than 24 inches. CLASS 3 – Fastest Rate of Evaporation. The water generally comes from overhead, affected the entire area, walls, ceiling, insulation carpet, carpet pad, etc. CLASS 4 – Specialty Drying Situations. This involves materials with a very low permeance/porosity, such as hardwood floor, concrete, crawl, plaster, etc. Drying generally requires very low specific humidity to accomplish the drying process. Every situation is different and requires careful assessment and constant monitoring to ensure proper removal of water and any contamination. When handling a water loss, we will be exposed to many hazards. The water may contain sewage, pesticides and other waterborne organisms that can cause disease. There may even be sharp objects and other debris in the water. Therefore, we take caution when entering any water damaged structure. We are not only concerned about the health and safety of our technicians, but also the health and safety of you, our customers. We will schedule to scope the damages of the water loss, using thermo hygrometer and moisture content meters, take pictures and measure the affected areas. We will determine what areas need to be dried out and areas that need to be removed. In order to dry these areas, we will use industrial size LGR dehumidifiers, desiccant dehumidifiers, air movers, and axial air movers. It is important to note that Water Damage Mitigation is unlike most other types of contractor work. An upfront estimate is typically not provided due to the progressive conditions inherent to water damage. Most of the time when a contractor is hired they will provide a general scope of work in their contract and begin work immediately. Unlike other contractors who have time to price out different materials and know exactly what work needs to be done during a remodeling of a home for example, emergency restoration contractors are working against the clock and taking the necessary time required to estimate a job would cause the spread of water unaffected areas as well a potential for mold. Flooding and water damage events in Columbia, Montour & Sullivan Counties commercial properties are often complex with numerous issues that require a knowledgeable and flexible response. Whether we are dealing with a relatively small water cleanup scenario or a large scale event, we work quickly to assess each unique situation and isolate the damaged area. SERVPRO of Columbia, Montour & Sullivan Counties specializes in the cleanup and restoration of commercial and residential property after a water damage event. Our staff is highly trained in property damage restoration. From initial and ongoing training at SERVPRO’s corporate training facility to regular IICRC-industry certification, rest assured our staff is equipped with the knowledge to restore your property. Call our office 24/7, at 570-759-0966 for all your needs! 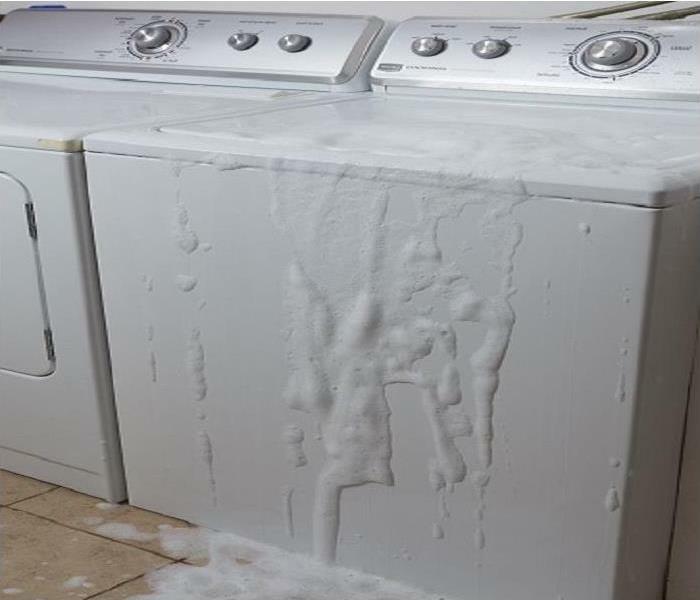 One of the chief causes for water damage to homes is the washing machine. With more automated machines and the level of complexity in today's machines, there are more areas that can fail. Some areas of failure: the pump may fail to pump water out or keep up with the water coming in and can cause the machine to overflow. A common cause is the supply water lines. These can be rubber hoses or can be flexible braided metal lines. Over time, the constant pressure may eventually cause a bubble to form near the end of the line. Washing machine hoses should be replaced every 3-4 years. It has become more common for people to place their laundry room on a second floor. If a washing machine malfunctions, water can easily seep through the flooring into the ceiling and rooms below. A situation like this needs to be handled as quickly as possible to avoid further damages, but cleaning up a mess this large requires professional knowledge and tools. If you should have a water emergency,call SERVPRO of Columbia, Montour & Sullivan Counties at 570-759-0966! We have emergency ready crews 24/7 365 days a year and can handle the task. There are several common sources of water damage in homes and businesses. Pipes, appliances, flooding, leaks in building envelope, humidity. Pipes: one of the most prevalent. All homes and businesses have pipe carrying water under pressure. 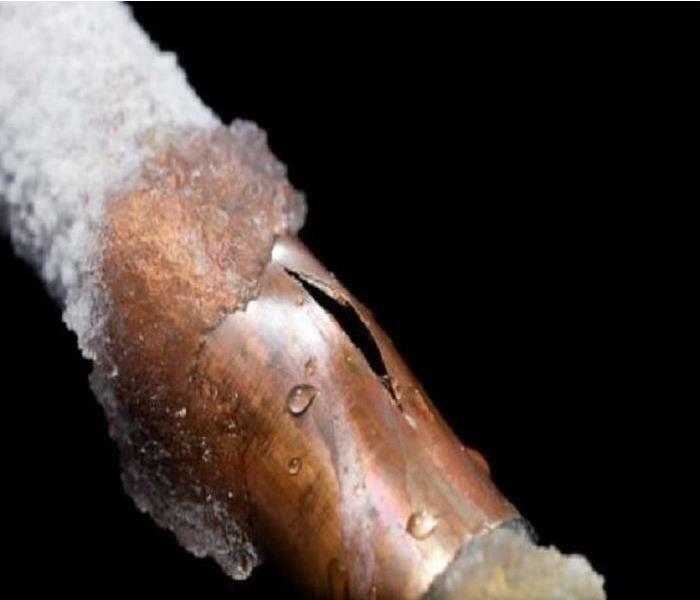 Extreme cold can cause pipes to burst. At times, spikes in water pressure can cause pipes to leak. Appliances: washing machines, dishwashers, refrigerator water lines, toilets, fish tanks are all possible sources of water damage. Flooding: typically flood waters are considered Cat 3 due to carrying biohazard materials from sewage plants, farms, etc. These are the more difficult to mitigate for the reason and caused more widespread damage. Leaks in building envelope: roofs, walls, windows. Each area of leakage can be difficult to find and even more difficult to remedy. Experienced structural personnel may need to be called to first fix the cause before mitigation can proceed. Humidity: levels of humidity that are too high in a structure can cause moisture damage to walls, ceilings, contents, etc. 4/1/2019 - Have You Been Affected By Fire? 4/1/2019 - Will you be ready?